Here is a new kind of puzzle, for this site for sure and at least I haven’t seen them elsewhere! Remember the Straights puzzle? Well, this is kind of like it… but it’s called POKER Straights. The reason being that there are all 13 “cards” in play… from 2 to 10 and then Jack, Queen, King and Ace. So… the rules are: in any region between two black squares (or between a black square and the border) the “cards” must constitute a poker straight. 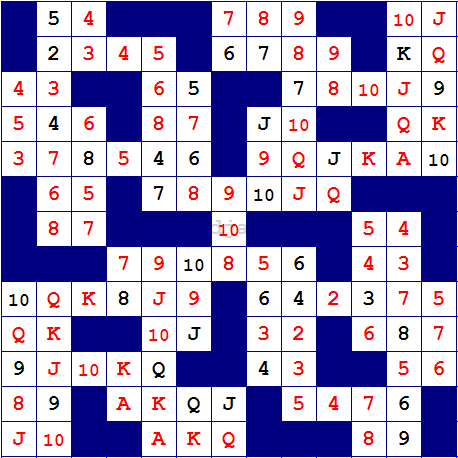 Now, in real poker, a straight is a set of 5 consecutive cards, but here there can be any number of cards in a straight, from 1 (any 1 card alone is a straight) to 13 (all 13 cards are, of course, a straight). Oh, and I nearly forgot… cards cannot be repeated in a row or a column! Now, DO NOT confuse this with Consecutive Sudoku! It is nothing like it. The cards in a region do not have to be in a consecutive order! For example, as we all know AKQJ10 is a straight. But also is KJA10Q. Or, 234 is a straight, but also is 423. Got it? Anyway… here is the puzzle. The difficulty is BRAIN! This entry was posted in Free sample puzzles, Puzzle variants and tagged BRAIN, Consecutive Sudoku, Consecutive Sudoku It, PDF, Poker Straights, Poker Straights Puzzle, rules, straights. Bookmark the permalink. Post a comment or leave a trackback: Trackback URL.